I have admitted in my previous post that I have a bad habit of touching my face. Imagine the germs or bacteria my face accumulates whenever I touch it. Thus, Alcohol is a daily life saver for me. I never go out of the house without an alcohol or sanitizer in my purse. I can not really remember the time I got addicted to hand sanitizers and alcohol. It has become a daily essential for me. I can finish a small bottle for days to a week only. Call it OC but as the old saying goes - prevention is better than cure. I have been sent by Rhea their newest alcohols which I am currently loving. It does not dry out my hands plus the scent is really good. I really hope they release a version in a spritz bottle. I transferred mine in an atomizer. 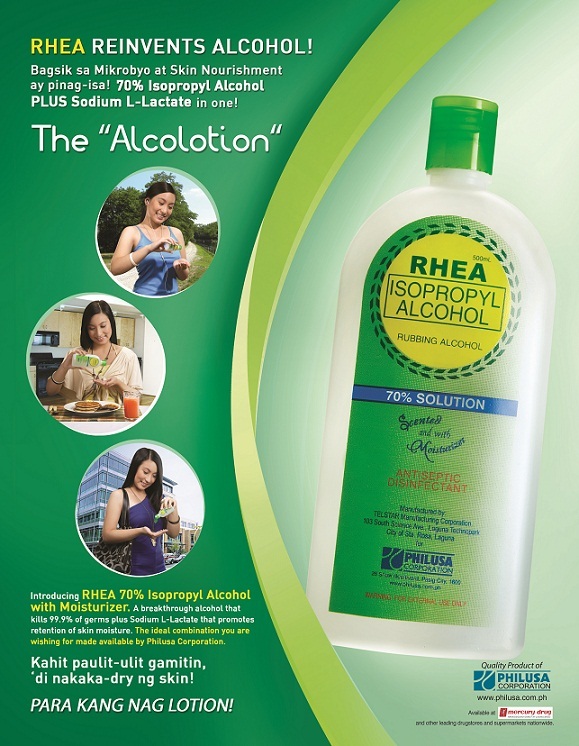 Rhea Alcolotion: The right alcohol for every workaholic. / Every workaholic deserves the right alcohol. Transportation is significant among the lives of every Filipino. That’s why there are various means of going to your workplace such as riding in a jeepney, bus, taxi, van, MRT, LRT, or even your own car. But due to the interaction and encounter with other people and things on the road, bacteria are easily carried and transferred to your body. Because of this, alcohol became one of our daily necessities and cleaning our hands through rubbing it on our palm is considered as a habit we can’t resist. People want to be clean all the time. As much as possible, we want to make sure that we are immune to diseases because we can’t afford to get sick and spend too much of what we’re getting. But excessive application of alcohol can damage our skin’s texture by leaving it dehydrated. With these in mind, Philusa Corporation created Rhea Alcohol with Moisturizer. It is a 70% Isopropyl Alcohol that kills 99.9% of germs and contains Sodium L-Lactate for the retention of your skin’s moisture. Now, you don’t have to worry about keeping your hands clean and tender all the time. There’s no need to limit your usage since you can enjoy a germ-free skin that is soft and worth touching for only 17.00 for 60mL, 28.00 for 150mL, 40.00 for 250mL and 69.00 for 500mL. With Rhea Alcolotion, Philusa continues to provide every Filipino with high quality, affordable products and remains to be one of the renowned brands in the health and wellness industry. Have you tried the newest Rhea ALcohol? I tried this before. But my family prefers the Green Cross brand.